Sonic Jam has gone through various changes over its development process. The following details several of these changes. 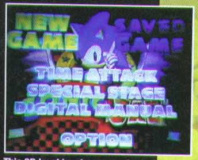 A very different menu screen. The balloon in the background is not there in the final. The HUD is also missing.